THE ORB-THE ORB’S ADVENTURES BEYOND THE ULTRAWORLD. Recently, I wrote and article about one of electronic music’s most influential and pioneering groups Kraftwerk. In that article, I said that Kraftwerk had influenced future generations of musicians, including electronic and dance artists. One of the artists who they had a huge influence on was The Orb. The Orb became one of electronic music’s pioneers, and are one of the most influential groups in electronic music. They were also responsible for producing one of electronic music’s finest albums, The Orb’s Adventures Beyond the Ultraworld. In this article, I will write about The Orb and their album The Orb’s Adventures Beyond the Ultraworld. The Orb were founded in 1988 and were responsible for spawning the genre known as ambient house. The two original members of The Orb were Alex Paterson and Jimmy Cauty. Cauty was also a member of another influential group KLF. In 1990 Cauty left The Orb, due to a dispute over which record company should release their music. The Big Life label offered the group a record deal, but Cauty wanted the album released on the KLF Communications label. This caused the group to split up. However, throughout their history, various other members have joined, and left, the group. After Cauty’s departure, four new members joined the group. These members were: Andy Falconer and Kris “Thrash” Weston, both studio engineers, guitarist Steve Hillage and producer Thomas Fehlmann. This was to be the line-up that produced The Orb’s Adventures Beyond the Ultraworld. When Cauty and Paterson first started performing they were ambient and dub DJs. Their inspiration was both electronic music and ambient music from the 1970s, primarily Kraftwerk and Brian Eno. Other genres of music also were a big influence including reggae music, Krautrock, drum and bass and trip hop. Amongst the other influences cited by The Orb are dub reggae pioneer King Tubby, Prince, Alice Cooper and T-Rex. Another thing that was a big influence on the group and their sound was science fiction. This is apparent when you listen to their music and hear some of the samples used, or if you were lucky enough to witness one of their live performances. Often in their live performances, The Orb have used imagery projected on to screens onstage that feature futuristic cityscapes and townships, alien beings, morphing faces, shapes and images and a multitude of other surreal images. Their videos would also feature such montages, which would often contain surreal images of clouds, astronauts and psychedelic images such as neon-colored dolphins. Such features led to comparisons to Pink Floyd’s early “happenings” or concerts. In 1988 The Orb released their first track Tripping On Sunshine on a German compilation album Eternity Project One. This track became one a popular acid house anthem. A year later in 1989, The Orb released a four track EP which was based upon samples taken from KISS FM, a New York radio station. This was released on Alex Paterson and Martin “Youth” Glover’s new record label WAU! Modo Records. The duo set up this label as they wanted to maintain their financial independence from the major record labels. Not long after that, Paterson and Glover decided to change the style of music they were producing. Gone was the beat-heavy music they had previously produced, in was music was a more laid back type of music. This was music that would be listened to post club, music for after hours listening. Around this time, The Orb were given the opportunity to DJ at the chill-out room in the Heaven nightclub. This event grew in popularity over time, and The Orb incorporated multitrack recording and then linked then to a number of record decks and mixer. They then used numerous records, CDs, cassettes, sound effects and samples in their set. What they did not use, was records without heavy rhythms and drum beats. The reason for this was so that they did not want to disturb the chilled out atmosphere. Two of their favorite types of music they played was chill-out and dub reggae. The duo described this as ambient house. Thus, a new genre of music was launched. In 1989 The Orb and Martin Glover, recorded a session for DJ John Peel’s radio show on BBC Radio 1. They had used a huge variety of samples and recordings on these songs. One of these songs was known as Loving You and featured the Minnie Riperton song Loving You. This caused a major problem, as Riperton’s management had not given clearance for the use of the sample of Riperton’s vocal. However, by then the single had been released. This lead to the track having to be re-released, with a vocalist who sounded like Riperton singing the vocal. The track’s title was then renamed A Huge Ever Growing Pulsating Brain That Rules From the Centre of the Ultraworld. Even though the track was twenty-two minutes long, it still reached number seventy-eight in the UK charts. Following the split with Cauty, Paterson started work on Fluffy Little Clouds with Glover. On this track The Orb used samples from Steve Reich’s Counterpoint and an interview with Rickie Lee Jones. Once again, The Orb fell foul of the legal system, and were required to pay Jones an undisclosed sum for the use of her voice on the recording. As if this was not bad enough, then Glover decided to rejoin Killing Joke. After all this turmoil, Little Fluffy Clouds only reached number eighty-seven in the UK charts. During 1991 the new line-up went into the studio and three weeks, six recording studios and around twenty other musicians later, The Orb’s Adventures Beyond the Ultraworld was completed. The additions had proved to be shrewd additions to The Orb. Falconer and Weston’s previous jobs working in recording studios provided the group with the technical ability required to create the sounds portraying the different aspects of space travel, and in particular, Apollo 11. Hillage’s guitar playing was used to good effect by Falconer and Weston to portray these sounds. When the album was released, it was well received by the critics in the UK, Europe and especially in the US. What the critics liked, was how the album encompassed ambient music, house music and sampling. The Orb’s Adventures Beyond the Ultraworld reached number twenty-nine in the UK album charts. In the twenty years since The Orb released The Orb’s Adventures Beyond the Ultraworld, they have continued recording, and released an album Metal Spheres as recently as 2010. In the last twenty years they have recorded nine further studio albums. The follow up to The Orb’s Adventures Beyond the Ultraworld, UF Orb was their most successful album, reaching number one in the UK charts. Throughout their career, The Orb have led the way, they have remained pioneers, challenging and changing the way electronic music is made and sounds. As well as recording and performing, they have enjoyed a long and successful career as remixers, and have remixed music for a wide variety of artists including Depeche Mode, Primal Scream and Jean Michel Jarre. Now that you I have told you about The Orb’s history, i will now tell you why The Orb’s Adventures Beyond the Ultraworld is such a special album, that it deserves a place in your record collection. The first track Little Fluffy Clouds starts with a sample of a cockerel and then the sample of Rickie Lee Jones, which is used effectively throughout the track. After that, the track is a magical montage of instruments, sounds and samples that, together, have effect of creating an atmospheric track, that holds your interest, and makes you curious to discover what happens next. When you listen to this track it is hard to believe that it was released twenty years ago. There is a freshness about the track, that makes it almost timeless. Earth (Gaia) is the next track on the album. Again, the track starts with a spoken word sample. This sample has a darkness about it, which is intensified with the use of the samples that surround and accompany it. The track slowly builds, introducing new sounds and samples, which increase the intensity of the track. Throughout the track the spoken word sample is used. This is effective, as it adds to the darkness and brooding nature of the track. I like this track as it was innovative and showed what it was possible to do using a combination of samples and instruments. A track like this, pushed the musical boundaries, showed people what it was possible to do. Supernova At the End of the Universe uses a combination of a clap of thunder and a spoken word sample about space travel to start the track. After that the track settles down to a minimalist sound. the rhythms are gentle, bereft of any prominent or heavy drum tracks. Then, all of sudden, the drum beats are the most prominent feature in the mix. Although they have the effect of overpowering the other sounds and samples, they sit well with the rest of the track. The intermingling of the drums, sounds and spoken word samples, combine effectively, producing an interesting, aural adventure. On this track, Back Side of the Moon, The Orb take you on a journey to outer space. This track has obviously been influenced by their love of, and interest in space travel and science fiction. When you listen to the various sound used on this track there is a soothing quality, that makes you think of space. This is further enhanced by snippets of spoken word samples, from what sounds like some of the old Apollo space missions. One can almost imagine floating gently through space, weightless, without neither a care, nor worry. This is a long track, just over fourteen minutes long, but when you listen to it, it has the effect of soothing and relaxing you, taking you away from the mundane and triviality of modernity, to somewhere, different, maybe better. This to me, is the best track on the album. On Spanish Castles In Space, the track starts quietly, then a spoken word sample briefly, interrupts the gentle, and soothing soundscape. Thereafter, the track starts to gently meander, but just as quickly as you have been lulled into a false sense of security, the sound changes, to a a darker sound, featuring a spoken word sample. This track is like a lot of The Orb’s tracks, it is a musical dichotomy. In one track you can hear the musical equivalent of light and shade, or night and day. This is one of the reasons that I enjoy this album, and this track. Perpetual Dawn features The Orb’s interest in science fiction and particularly, space travel. You will hear part of the countdown that is heard when a space mission launches. Then you will hear noises, and samples that defy explanation, set against a mid-tempo beat. This repeats and features some surreal sounds, which to me, do not work in the track. By three minutes of the nine and a half minute track, I am hoping that the track improves. Thankfully, there some improvement. However, this track does not have the quality of previous tracks. Into the Fourth Dimension is a better track than Perpetual Dawn. This track features various samples at the start. They provide a nice contrast. From spoken word samples, to a choir singing, this is a good way to start the track. Once again, The Orb are lulling the listener into a false sense of security. What follows in crunching drum beats right at the front of the mix. Sitting behind the drumbeats are violins, snippets of classical music and dark brooding samples, some almost inaudible. The track builds up throughout the track, layer upon layer of sounds unfolding, coming together to create a powerful track that peaks about 115 beats per minute. This is a huge improvement on the previous track. On this track The Orb have got their A-game back. This track shows how The Orb were willing to push the boundaries of music, and why they were innovators, that many younger dance and electronic artists cite as influences and inspirations. The next track, Outlands, features a moody, atmospheric start, using a number samples that make the listener focus on the music. Just when you are getting used to the slower tempo, things change, the tempo speeds up, the samples get louder, faster and even more surreal. You begin to wonder, what an earth will happen next. You become fascinated, drawn in to the track. This truly is an aural adventure through a parallel universe, one that you have never visited, and one that you could never have imagined existed. The track takes you on a surreal journey, where you hear sounds that you just can’t quite identify, snippets of speech float in and out of the track, and in front of that, constantly there, drumbeats that are heavy, that crunch and don’t let you forget that they are there. Outlands is a great track, one that takes you on the type of journey your local travel agent can’t arrange. Stars 6 and 7 8 9 is the penultimate track on this album. The track starts with the trademark use of samples, this time the sound of a car engine, birdsong and then a spoken word sample. Even the sound of a bee makes an appearance. Over and above all this is a glorious tranquil rhythm, which has the effect of relaxing the listener. However, by now we know not to be lulled into a false sense of security, because anything could happen next. The track gently saunters along, gently caressing the brains neurons and synapses, the rhythm ebbs and flows, complimented by numerous well chosen samples. There is nothing in the track that interrupts the tracks beauty, this is definitely post-club listening. This is easily one of the best tracks on the album. Eight minutes of glorious tranquility, one you should definitely experience. The final track on The Orb’s Adventures Beyond the Ultraworld is A Huge Pulsating Brain That Rules From the Centre of the Ultraworld: Live Mix Mk 10. As well as having the longest title on this album, this track is also the longest in length, coming in at just under nineteen minutes. This is nothing, one of The Orb’s singles, Blue Room, was almost forty minutes long. Despite that, it still managed to chart, reaching number eight in the UK charts, the longest ever single to chart. This track, however, has a slower tempo and features everything we, by now, expect to hear in a track by The Orb. Throughout the track, the group of used a multitude of sound, samples and instruments. In this track, there are the samples of the cockerel and the Minnine Riperton soundalike. All of this is effective, contributing to the overall quality of the track. This is like a long musical soundscape, composed using only technology, samples and a few instruments. Although the track is “busier” than some of the tracks on the album, this does not make it any less of a track. Quite the opposite, The Orb should be congratulated for achieving such a complex track using only the technology that was available to them at that time. This is a good track, although not the best on the album. The Orb’s Adventures Beyond the Ultraworld is like other albums I have previously written about, it is innovative. The Orb pushed the musical boundaries when making this album. They showed what was possible by using the technology that was available, and also a lot of imagination and creativity. Considering the technology at their disposal, what they have produced is quite amazing. Nowadays with all the new music software, and technology, artists and producers have at their disposal, creating a track is much easier. Back in 1991, The Orb had to work out how to create that tracks on this album. There was no person or book they could refer to, because what they were doing had never been done previously. They were pioneers, innovators, much like Kraftwerk, one of there heroes were. What they have produced is truly a great album, one that sounds as good today, as it did in 1991, when it was released. It really is timeless. 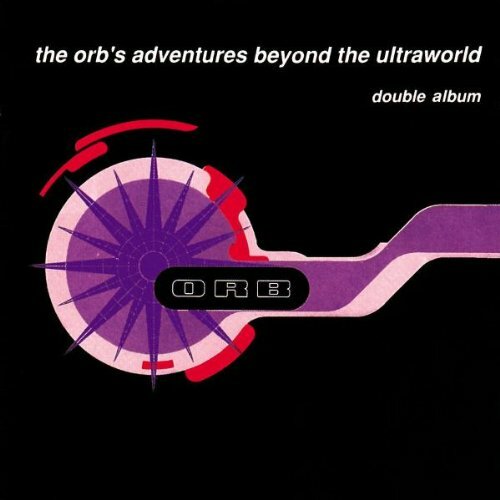 If you have never heard of The Orb or their album The Orb’s Adventures Beyond the Ultraworld, I would recommend that you go out and buy it. This is an album that is one that should be in every record collection, it paved the way for much of the electronic and dance music that came after it. It is not just electronic and dance music it has influenced, many other artists now use samples and computers in their music. The Orb’s have influenced a generation of musicians, and many people’s first exposure to electronic and dance music would be this album. So if, after reading this article you are curious, I would suggest tomorrow, go visit your local record shop and buy a copy of this album, you won’t be disappointed. If you want to buy another The Orb to accompany The Orb’s Adventures Beyond the Ultraworld, I would recommend their next album U.F. Orb. What you will have in your possession are two great albums. I hope you will enjoy them. Standout Tracks: Little Fluffy Clouds, Supernova At the End of the Universe, Back Side of the Moon and Stars 6 and 7 8 9. ← OTIS CLAY-TRYING TO LIVE MY LIFE WITHOUT YOU. This would have to be the beat review of this album I have read to date. Tga ks for haring this. The orb have been a constant companion in my life and this album remain a firm favorite an on of the best ambient music albums of all time. Hi Jenny, I too have always loved The Orb’s music and Adventures Beyond the Ultraword remains one of my favourite albums. Every time you listen to it, another of its subtleties or nuances reveals itself. It truly is an outstanding and influential album, one I’ll never of tire of hearing. Thanks for your kind comments. Hi nice review, its Kris “Thrash” Weston not Kim “Thrash” Weston btw. Thanks for your comments. I’m glad that you liked the review. Did you buy see my other two reviews of albums by The Orb. I hope that you liked them too. Keep reading my blog, there’s new reviews posted every day.